There are some exclusive types of furniture articles that manage the overall performance of a sitting plan like sofa, benches, chairs and coffee tables! For any type of sitting plan a coffee table is always must to include as a central addition due to its due to its both decorous and functional performances! This is a piece that is not to miss out in anyway and provide a big help while establishing sophistication to any living room interior! 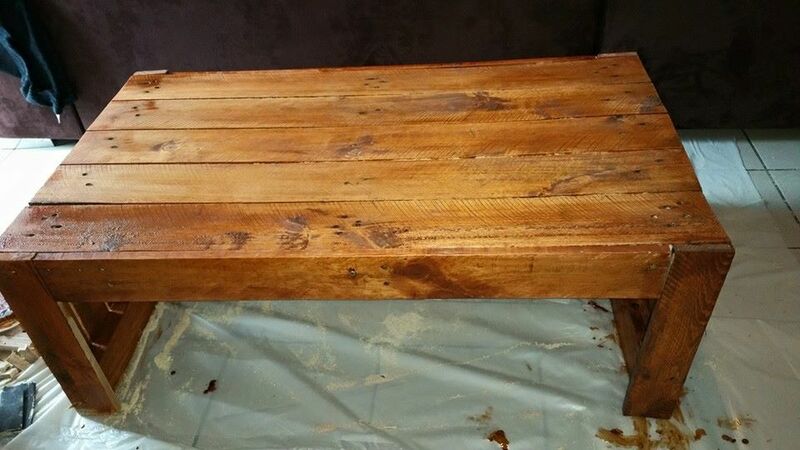 However, if you are a lover of DIY creativity and really want to go handmade to get a coffee table at home then this DIY rustic pallet coffee table is the best recommendation here! Design has totally been made of highly stable pallet wood boards undergone through a process of deconstruction and reconstruction! Table top stands on two flat legs made of pallet planks integrated in slatted pattern! Plan some stain coats, varnish coats or polyurethane coats for a charming visual and weather-protective finish of the table! This post is a visual tutorial of how to build a simple coffee table with step by step. The first picture points to the dismantling of some pallet boards into small pieces. In the second step the dismantled pieces are yoked together with some screws and some tool work to form the initial structure of the simple coffee table. This the final look after cutting and joining sessions which comes with a table top and two legs. The legs have been crafted by using a small piece of pallet board fora leveler standing on the ground. The table has been sanded well for the smoother touch and surface so that it can be stained with a variety of shades depending on one’s personal choice as brown has been painted in this case.